We specialize In "Industrial Painting"! House Painters Vaughan and Toronto's industrial painting services offer various types of painting throughout the GTA and Southern Ontario. 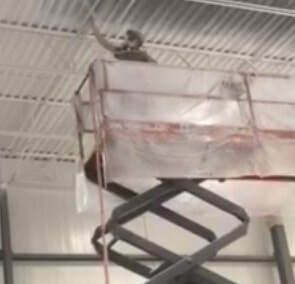 It takes a special knowledge and sound planning when attacking industrial work such as ceiling spraying, lasting adhesion with all types of surfaces and right down to line painting concrete floors and other hard surfaces. We understand that our coatings need to be durable, long lasting and supply protective qualities that one would expect. Whether applying our coatings to floors, walls, ceilings, equipment and shelving, we make absolutely sure that the finished product is up to our customer's expectations and we guarantee it. We are always ready to show you our work and our satisfied customers. Our industrial painting group have experience in various industry sectors such as manufacturing and fabrication, assembly plants, warehousing and fulfillment, recycling and much more. Home Painters Vaughan works very hard at being the best industrial painters in Southern Ontario and you can count on us to deliver the finest coatings in the business. One of the coatings we are proud of is our rust control covering that arrest the rusting effect and add years to the life of equipment, silks ans storage tanks and other applications. Ask us about the possibilities. We have a lot of great coatings but one that offers very good value and can extend the life of metal structures and containers is our rust coatings. This lifesaver product is a one stop shop for all things in metal renewal and lead paint encapsulation. Seal pretty much any surface with primer, strong second coat, and top coat in just a single application. Industrial painting (and commercial) involves several different surfaces and styles. There are many interesting products available for protection, colours and extending life of metals and other surfaces.